This photo is part of the 100 Snapshots Challenge. It was taken in Chicago with my point and shoot camera. I have always been a creative person. This creativity first manifested itself through writing. It was the easiest, most accessible way for me to express myself. As I got older, I fell in love with photography. My friends would constantly groan and make fun of me because I had to take photos of everything. When I participated in the “100 snapshots challenge” on Live Journal, my photographs began taking a more artistic turn; I discovered that there was more than one way in which I could express myself artistically. For years I shot my photos with a small “point and shoot” digital camera. It was easy to carry around and I was able to take pretty decent photos with it. However, I found myself wanting to have more control over my images and wanting to try techniques that a point and shoot just couldn’t accomplish. When my husband bought me a Canon Rebel XSi for Christmas in 2009 I was off and running. From the start, photography presented far more physical challenges than writing. Obviously I can’t get to some of the places that other photographers might, which is frustrating, but I have found ways around a few of the challenges that photography presents. My biggest problem, besides the accessibility of some locations, is keeping the camera steady so I can get a nice, sharp image. Single Lens Reflex cameras, like my Canon, are much heavier than point and shoots, mostly because of the lenses. This means you need two hands to take a photo, which is pretty difficult to do if you use crutches or a walker to hold yourself up. Canon has lenses that come with an image stabilizer option, which is awesome and does help, but the feature makes them more expensive. Plus it is primarily for smaller movements, as opposed to the kind of camera shake I was experiencing. To solve this problem, my husband came through once again, and bought me a tri-pod. I use the Vista Attaras FZ10. This tri-pod is stable enough for me to lean on if needed, which is quite important for me. Another feature I like is that it can be adjusted to almost any angle and height, making it easy to get steady shots whether I am standing, using my chair or want to get closer to the ground. An additional perk is the carrying bag that can be worn across the body or on the back of the wheelchair with very little assistance needed. The last thing that has been essential to my success as a photographer is my Lowepro Backpack. I bought for my trip to Colorado. It holds my camera, all my lenses, as well as my laptop and anything else I might need or want while taking pictures on the go. I use this backpack whenever I might need to change a lens, even in my own backyard. It keeps all my accessories safe and at hand. This photo was taken with my Canon SLR camera on my trip to Colorado. Photography is a great way to express your creativity and share your experiences with the world. Whether you choose a point and shoot or a SLR, I encourage you to give it a try. If you don’t know where to start, try the 100 Snapshots Challenge. The page has not be updated in ages but the list is still there and it is a great way to get those creative juices flowing. 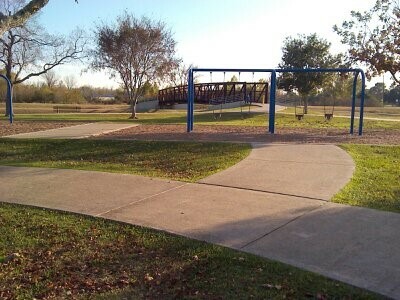 Centennial Park is located off Fite Road and McLean, in Pearland, Texas. 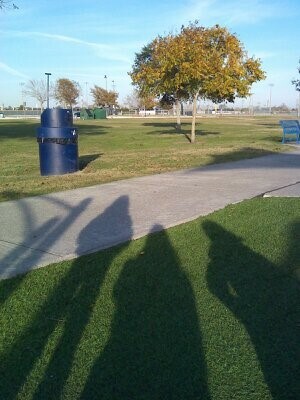 This park is well maintained, spacious, and fun! 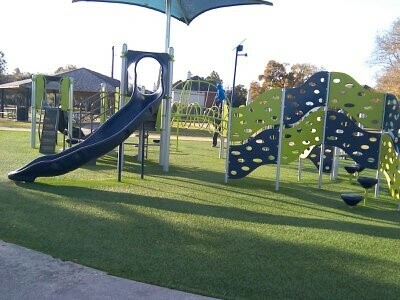 It has park areas sized for big and smaller kids, swings, as well as basketball, tennis, and baseball facilities, and a lot of green areas for chasing, hide and seek, and other games. There are walking trails by the creek, and a bridge connects the main park to a splash pad area that is open during the summer. You can rent the large pavilions for events. 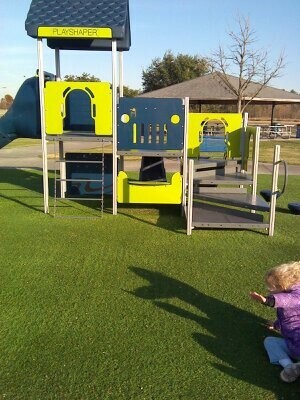 This park has a lot to offer for kiddos’ gross motor, fine motor, and sensory needs. I’ll list a few here. 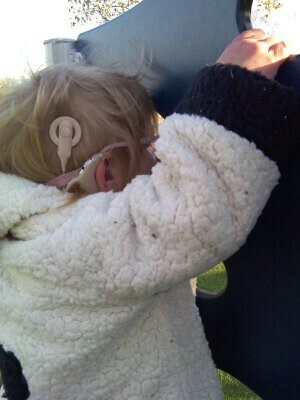 The parking area is about 50 yards away, so I try to make Leila walk over the grass to the play area. This helps with gait training. Aside from the slides and swings which provide vestibular stimulation as well as (if your child can pump his/her legs) muscle strengthening, there are 3 spinning seats for a true blackout experience. One is about the size of a hot tub, and can get pretty crazy with a lot of kids. Two others hold one kid only, for those that are either smaller, or not used to noisy groups. 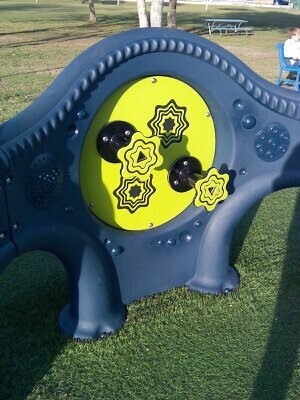 If your kid is spinning others in the big one, they will also work on upper body strength and hand-eye coordination. Visual and auditory stimulation is provided by the neat little double-sided wall that includes a rotating color wheel, spinning optical illusions, and kaleidoscopes. One sounds like a rainstick as it spins. Tactile stimulation is provided by the raised letters and shapes on this wall. 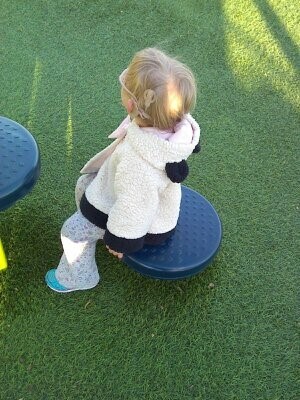 Leila likes the modified rock wall. 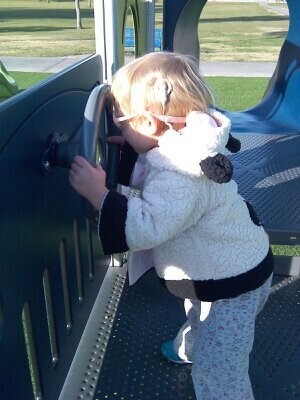 Other playground rock walls have knobs or narrow ledges. 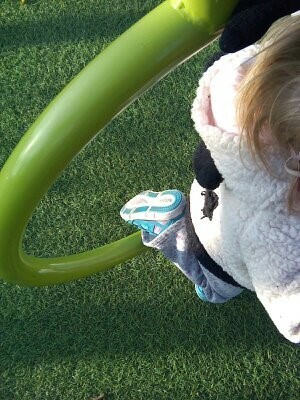 She likes to climb, but her right-side weakness make her hand and foot slip. The open holes on this one give her better grip with her hands and feet. It’s good for gross motor and motor planning (which hand/foot comes next?). Also, it goes higher up, and sideways, to work a kid’s lateral coordination. 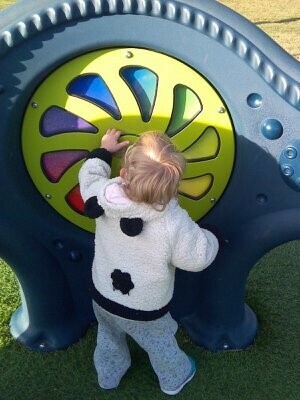 Bilateral coordination is worked with the play car wheels, which provide a push/pull experience. Sit-to-stands for leg strengthening can be done on the little disks which are of various heights. Balance training can be done by stepping from one to the other. Going in and out of the monkey bars works coordination and gross motor, as she has to shift her body weight and lift her legs high to clear the bar. 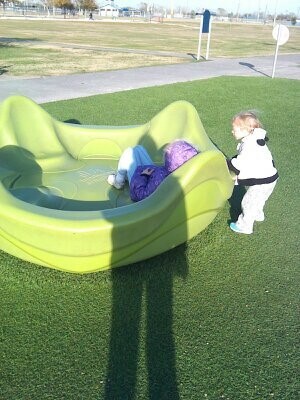 This is a fun park and we go at least once a week. Cons – go pee before you leave the house. The bathroom is a good hundred yards away from the play area. Leila gives it 4 (out of 5) Leila likes! Hope to see you there! After my injury things changed. My fingers were paralyzed, baking cookies was no longer easy-breezy fun. Heck, I couldn’t even hold a sugar shaker anymore without dropping it. It wholly depressed me how difficult my passion had become. And the worst thing was feeling like baking was the last thing I wanted to do; not at all like “me.” I resented how my injury changed so much about my life and personality. I was determined not to let this new feeling I had towards baking last. So I made this resolution 8 years ago to figure out how to bake again, and I haven’t looked back. Ever since OT, I always knew baking was possible; they showed me it was. I just knew it was going to take a lot of work, patience and a few adapted instruments along the way. I started by sticking with just a few simple Christmas cookie recipes. Knowing your limitations is #1 rule when baking with a disability. This means I nixed a few of the more complicated recipes off my list – Rosettes, Peanut Butter Balls and a few others – and added a few more I knew I could do easily. Anything that required a VERY specific amount of dexterity was removed. I learned the lesson of knowing your limitations the hard way too, not even thinking of my limitations in the beginning. My first go at it, I discovered midway through baking a recipe I couldn’t finish it (I sure felt silly). The thing to remember is this – always think critically about your skills when creating a list of the Christmas cookies you want to bake this year. Keep it simple – pre-cut sugar cookies, bars, candy, drop cookies, no-bake cookies – anything that requires minimal dexterity is best. I also began using my toaster oven to bake since it was at countertop level, which made it way easier to put in/remove pans and I still use my toaster oven till this day. I also created a nifty way to remove pans from the oven when they’re still hot by using an infinity scarf. I just push then scarf around the pan, then lift it up in the center of the pan to take it out of the oven. After taking the hot pan out, I love using My4Hands too, a thick piece of plastic that goes on my lap and protects my skin from hot pans. It works awesomely. Don’t forget – homemade Christmas cookies make great gifts too. All your hard work is more appreciated this way too, when loved ones can see all the extra TLC you put into their gifts. What’s your favorite Christmas cookie? I am one of those girls who loves the holidays, but after my accident things got a little weird. From not being able to use my palms to roll peanut butter balls anymore to not wrapping presents with my mom on Christmas Eve like we’ve always done, I quickly found out that things were not going to be the same. I’ve however refused to let this ruin my holiday experience. I did at first. I got down every Christmas for like over ten years straight, thinking about how much better the holidays were – going sledding hill during Christmas week off, ice skating on the lake, making homemade garland out of popcorn, I missed it all. And more than anything I feverishly wished for my innocence back. I though had a change of heart on the holidays a few years ago. My grandpa died and I had one of those moments where you realize life is too short to only enjoy something unless you do it the way you want to. We rarely ever get what we want in life. I realized I wasn’t going to get better; I had to find a new way to enjoy the holidays, and that’s exactly what I did. I started my goal of falling in love with Christmas again by trying to find things I could still do. 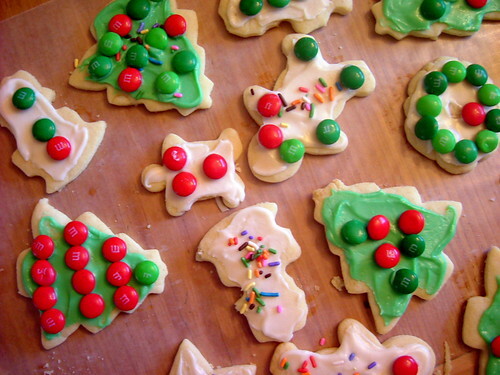 While I couldn’t make many kinds of Christmas cookies anymore because the recipes were just too complicated, I did find something I was good at – decorating cookies; sugar cookies to be specific. I decided to embrace this and I now have dozens of cool and unique cookie cutters that I love to collect. Everywhere I go I’m always on the hunt, and it’s fun. This is something I’ve become good at post-injury, and damn it feels good. I’ve also discovered a new love for Christmas decorations. I was only 14 when I was injured, so decorations weren’t really on my radar, but boy are they on my radar now. I love snow globes, Santa Clauses, vintage Christmas decorations and the classic Christmas decoration – candles. A Christmas candle, whether it’s scented like pine tree forest or a gingerbread house – amazing. And I’ve discovered a way to light candles; not easy to do with paralyzed hands. I used to use my Zippo lighter to light candles, but now I use a torch lighter; made for cigars but they’re SO easy to use. All you need is an incense stick and you’re set. Get a flame going on the end of the stick after activating the lighter by hitting the button, and stick the flame near the wick of the candle. See, candles lit, your place is all Christmas-ey; easy as pumpkin pie. It’s awesome; I never thought this day would come – it’s almost Thanksgiving and I’m actually excited for the holidays. No longer do I strictly reminisce about what once was, and I must say it feels so good to reclaim Christmas. From James Bond movie marathons to tree ornament shopping, it’s crazy. I made it work. Do the holidays make you sad? How did you get over it?